Some people will go to the extreme to lose weight or relieve stress that occurs in their lives. Many people try acupuncture to help them make their lives easier. I personally have not tried acupuncture to help me with weight loss or problems in my life, but I do know that people swear by it. My point of view is that I don't think acupuncture works. I think people star to believe that it works and therefore they continue to use it as a "medicine". The question that arises is does acupuncture really work? Some information about this alternative medicine is that it was originated from China. The Chinese believe that we have this spirit or energy in our bodies called qi. To help balance this entity out, the Chinese would puncture the skin in the area where we have acupuncture points. 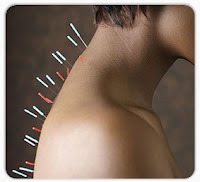 It is said that sticking these thin needles could prevent bad health, treat infertility and relieve stress/pain (Wikipedia). I read that acupuncture would help reduce nausea and vomiting after patients went through chemotherapy for cancer. Scientists have found that acupuncture calms the area of the brain that processes pain, subside inflammation and keeps the blood flowing. Some cons to acupuncture are that it has lead to fatalities where the point of insertion got infected and that the needles hit vital organs. Scientists did experiments with volunteers where they were pricked with toothpicks and then real acupuncture was used on them. The results showed that the brain showed calmness when both experiments happened. Therefore, the placebo affect happened for most of the volunteers. I interpret that there are scientists who will never agree on the concept about acupuncture. Many scientists believe it works while others do not. Therefore, I believe that many people have the placebo affect and that it does not work. To many fatalities have happened and infections. In conclusion, until acupuncture is proven to work without other evidence against it, I will stick with my belief that it doesn't work.